When faced with marking out a workpiece, either for positioning a hole to be drilled, or an indication of the point to which it has to be machined, then a number of options are available. 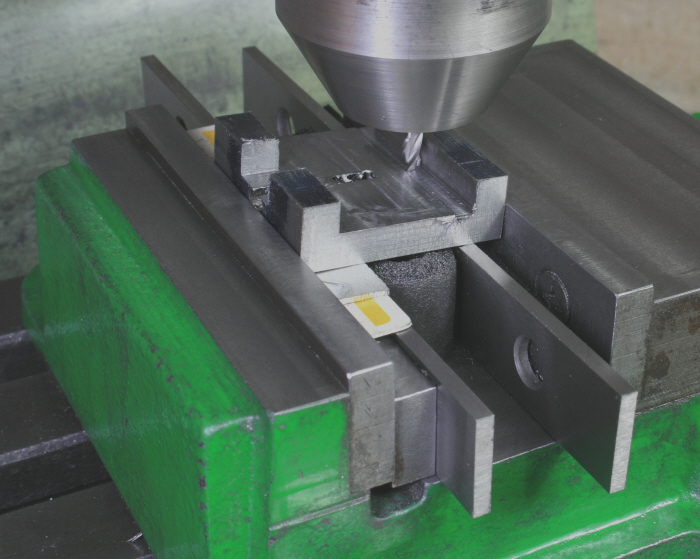 Typically, using a rule, square and scriber, or a surface gauge or height gauge on the surface plate, each having its advantages and disadvantages. 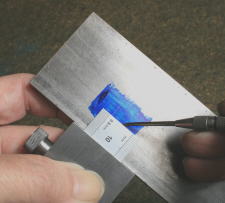 In many cases though, the little attachment in this article will provide an easier and quicker method and be a more than adequate method of getting the dimension onto the part, Photograph 1. The device will hold both 25mm and 20mm wide rules and would normally be used as the photograph shows but where the dimension is being set from the end of a narrow part it can still be used if the gauge is turned over. This is quite straight forward but do drill the 6mm diameter hole “A” before machining the area to take the rule. 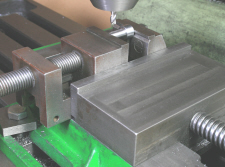 Also, having machined out the place for the rule to sit, and whilst still in the vice, place a thin piece of packing under one edge to raise it slightly and with a small end mill machine the slope as shown on the drawing, Photograph 2. Its purpose is to ensure that the rule is securely held, the angle though being unimportant. This appears to be a difficult item to make but in fact it is quite simple being more difficult to visualise and draw than make. Place a piece of 10mm steel in the three jaw, turn a 12mm length to 6mm diameter, drill and tap M3 10mm deep and part off at just over 18 mm in length. Return to the chuck and machine the face just parted off. Next, mill a flat on the 6mm diameter to establish the 5.5mm dimension, Photograph 3, followed by tilting the clamp slightly and make the clamping face using a small end mill, as was done for the body. Turn the part over in the vice and support the face just machined on a parallel and make another flat to create the 2mm dimension shown, Photograph 4. Do note that this is only over the length of the 10mm diameter. 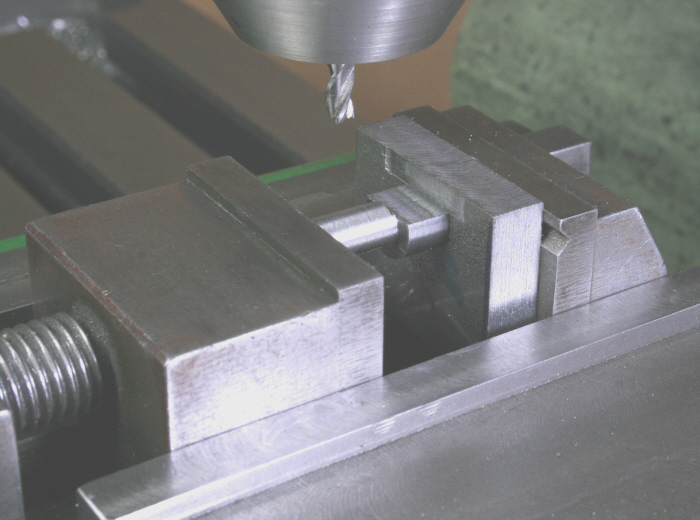 Then, with the part still mounted in the vice, in the same way reduce the width over the same distance to 3mm and the part is then complete.